(Newser) – Apple's patent victory will cost more than just the $1.05 billion judgment against Samsung—expect non-Apple smartphones to cost more as manufacturers begin to pay Apple for a variety of new licenses, reports the Wall Street Journal. Samsung was found guilty of infringing on seven patents, including those covering common features such as the ability to enlarge images with a tap and the look of icons. Apple is trying to create a monopoly. Wow, this drivel is laughable. Have most of you even read the pieces on the legal merits of the case? Apple has used Samsung components for years - whether custom made for Apple or parts on the open market. The price is negotiated, including any intellectual property issues and commerce goes on. This suit has nothing to do with conventional commerce. It has to do with stolen property. Sammy had the opportunity to work these issues out with Apple before the suit and took a calculated risk. The bigger risk is to Google and the whole Android Ecosystem. 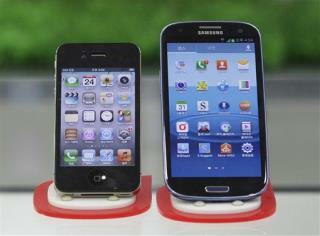 Apple has claimed that every Android product, at its core, uses stolen intellectual property. That's the meat of the story. Where future Android products include a chunk of change for their intellectual property or the future iterations contain self-developed work-arounds remains to be seen You can myopically view it as an Apple Tax or what it really is, payment for intellectual property, just like a great number of components in any smartphone, there is a cost to use a patent or forty. Doesn't matter. Apple deserves to be compensated for it's intellectual property - as would any inventor.